5 days into the volcano mess and the finger pointing is starting, some of it more and some of it less well argued. Charlemagne has an elegantly penned argument of why he will not comment, while EUObserver has a summary of the rants of Europe’s politicians. Alejandro meanwhile has a go at interpreting everything according to bureaucratic meltdown. I’m not going to try to wade into the debate about whether (or not) to open or close airspace. I haven’t got the faintest clue about the pros and cons of all that (although I fear an irrational approach to the risk that something scary might happen is behind it). Secondly, if your train is on a dedicated high speed line, or is reservation only, you’re more likely to have problems. SNCF and Thalys are the prime examples here. Investment has been in high speed trains on dedicated lines, to the detriment of investment elsewhere, and with the rapid expansion of the network there are few spare train sets. Plus as these trains are compulsory reservation you can’t easily stand in the trains either. 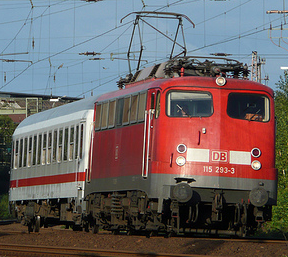 The German hybrid model – ICEs and ICs on most new lines – can cope better in times of exceptional demand. Also the little signs in ICEs telling you what seats are reserved when really helps fill a train efficiently. Thirdly, if you’re on an international route it’s even more hopeless, especially if that’s served by a high speed line (for example Köln-Brussels, Brussels-Paris). There will be a lack of train sets and the problem will be additionally compounded by a lack of multi-voltage locomotives that could run replacement trains. SNCB Class 16s could be pushed into service, but that of course would require cooperation of SNCB and DB… hmmm. Fourth, all of this is compounded by a national approach and a lack of proactivity on the part of the railways. Eurostar is an exception here, having laid on extra trains and made tickets available at a special price, but the railways never seem to be able to give the impression of flexibility and proactivity. I’m convinced that passengers would all be ready to get to their destination more slowly if only everyone was to be able to get there in reasonable circumstances – I’m not convinced the railways always bear this in mind. Could better planning for exceptional circumstances be better legislated for? So then, in summary, you’re stuck somewhere in Europe and you want to get home. What should you do? Go through Germany rather than France – no compulsory reservations, no strikes, extra trains, and even when no extra trains then buses. Use Deutsche Bahn’s rail planner – reiseauskunft.bahn.de – to plan your trip and for some journeys you can even get online tickets. You can also search for connections not involving any high speed trains. Get on Twitter and Facebook and ask for some help. I’m happy to assist via Twitter (and to friends via Facebook). Last of all – if you have managed to get to the end of this post – head over to RailRights.eu and help me and fellow bloggers to keep an eye on Europe’s railways and improve matters for passengers! Pingback: bloggingportal.eu Blog & Support » Blog Archive » The Week in Bloggingportal: Help! The British are Invading! Good post again, thank you. As for France, in normal times I would agree with both your comments and your recommendations. However, the air-traffic disruption – here in France – coincided with a rail strike. This is not so bad as you might suspect, in that it involved only some trades unions and their militants. However, it did mean that reservations for TGVs went by the board: all you needed was a “ticket to ride”! Thus, friends were able to get from Egypt to Milan by plane, then train to Paris and TGV to home, despite the volcanic ash. Because they fought their way aboard the TGV they managed to secure some seats, whilst others were left standing/sitting on the floor/propping themselves up anywhere. Ticket inspectors couldn’t get through. NB I’ve found that the DeutscheBahn trains on the Paris/Germany routes are better than the French equivalents. As for FR-DE – the ICEs on that route are the nice, slick new ones, and the TGVs are at least modern but less spacious. But then we come to the engineering – I would much rather be on a TGV at 320km/h than an ICE if something goes wrong with the engineering.